My morning Crackdown 2 appointment started awkwardly last week. Double-booked. Game not running properly due to a technical mix-up. And then, those things rectified, I cheerfully mentioned one my favorite Crackdown features: Oh, the sequel's creators said. We cut that. You may not agree that transforming cars were among the best elements of the 2007 Crackdown released by Microsoft Game Studios and original development studio Real Time Worlds. Sure, the ability to instigate open-world crime-fighting mayhem was a good feature. So was the option to upgrade your hero's jumping ability by collecting glowing orbs tucked into the folds of the architecturally striking Pacific City. So too was the option to improve your hero's strength, weapon-wielding, and driving abilities by killing bad guys with said skills. Yes, Crackdown was a lot of fun. I liked getting in a car and watching it transform into a faster, stronger car, based on how good a driver I was. I won't be doing that in Crackdown 2, because Crackdown 2, set 10 years after the first game and featuring a new playable super-cop's attempts to clean up a city filled with one terrible gang and one infestation of zombified citizens, does not include morphing cars. The cars, the trucks and the helicopters have one form each. Just the one. No matter how high my super-cop's driving skills may be. I am certain that Microsoft producer Peter Connelly and producer James Cope of the sequel's new development studio, Ruffian Games, did not plan to start their meeting like this. They had wanted me to play their new game in co-op, an option that has been expanded since the first game to support four players — and which allows those players to spread across the city, engaging in separate missions, if they so choose. In other words, they had planned to start this meeting by giving me an impression of what they added to the Crackdown series, not what they subtracted from it. They explained that the morphing car option was removed because it required too much system memory that would be better used for features more gamers would access. It turns out that a lot of Crackdown gamers didn't upgrade their driving stats. I guess they didn't figure out that you could drive one small looped road a bunch of times and tally all the bad-guy roadkill you needed to be a top-rated driver. Or they didn't care. Moving right along, I mentioned to Connelly and Cope something else I really liked about the first Crackdown: How you could take down the henchmen for the game's major gangs in any order you chose and how you would see the effects of your decisions persist throughout the game world. If you took down the weapons dealer, for example, the rest of his gang would have worse guns. If you went after the car guy, the gang would have inferior cars. As I was mentioning this, I sensed I'd just made the morning even more awkward. Let me guess, I guessed: That's not in there either? Oh no, Cope and Connelly told me, that's been changed and improved. The gang thing was all about "persistence," they explained. It was about doing one thing in one corner of the game world and seeing that change reflected as a new status quo elsewhere. The concept that a gamer can change conditions in the world is actually still a rarity in open-world games. It's not in any Grand Theft Autos, for example. The Crackdown 2 men said that the new game would provide even more persistence by allowing gamers to travel to any part of the game's city at any time and try to activate special beacons that affect the number of zombified enemies that amass in the city's streets. The player can also liberate "tactical locations" that can be turned into resupply stations, garages and save points, all in one. That all sounded good, and maybe a fine alternative for the system I liked in the first game, but I'm not sure. I didn't dare mention anything else I liked about the game. Well, maybe I joked that I liked the explosions or something. And maybe they joked — just joked! — that they took those out. So I shut up and stopped reminiscing about cool stuff in the first game and let these developers tell me about new stuff in the new game. The new game gives players a perk when they hit level five agility that lets their super-cop glide through the air. The new game lets players level their character up not just to a fifth level of ability to a secrecy-shrouded sixth. The new game has at least one building that is taller than the first game's Agency Tower. And it has helicopters — a fair trade for not having morphing vehicles, Connelly asked/suggested. The new game has 500 collectible agility orbs, the glowing green things that enable an agent who grabs them to eventually leap small buildings in a single Mario-scale bound. Ruffian sounds like they're going to make a player's hunt for the final few orbs a little easier — maybe by giving players access to a marked map showing the last few they need. They're not certain about that, as they don't want to anger the gamers who love searching for the things. The new game has a lot more things that can be shot and blown up, a lot more characters in the streets, a similar road layout to the first game with new buildings throughout. Oh, and the new game has "renegade orbs," which are agility orbs that fly away from you when you first try to grab them. There can be five increasingly devilish variations of them, the easier ones fleeing the player in set paths, the more advanced ones using artificial intelligence to evade the player. The new game doesn't let users place orbs of their own — my idea, suggested during this morning meeting during which I kept saying the wrong things. "We did think about it, but it is not in the shipping game," Connelly said. Okay, so maybe Crackdown 2 might be missing a thing (or two) that I liked about the first Crackdown. But this new stuff did sound good. And once I got my hands on a little bit of the single-player game, my ability to throw buses, glide out of helicopters and blow lots of things up all felt like enhanced Crackdown to me. I will miss my morphing cars. 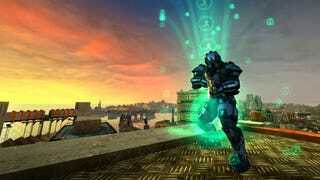 But I do not think that will make me miss Crackdown 2 when it ships for the Xbox 360 in July.